Members of the Save NA Schools group are confident they got their message — don’t close Peebles Elementary School — across to the North Allegheny school board during a seven-hour public hearing that didn’t adjourn until 2:20 a.m. last Thursday. But superintendent Raymond Gualtieri’s statement following testimony suggested the group still may face an uphill battle. Board members will vote in May on an administration proposal to close the school, which is in McCandless. Speakers during the Jan. 30 public hearing were from all seven elementary schools, although most represented Peebles and Hosack. North Allegheny School District residents opposed to closing Peebles Elementary School are questioning why an engineer conducted a recent study of the school for free. Alan Lilienthal, a Peebles parent, wondered whether it is appropriate for the district to have accepted a free study. “I also wonder why anyone would work for free, unless there was something to gain down the road,” said Lilienthal, of McCandless. But Jon Thomas, of Thomas & Williamson Program Management of Ross, said the district asked him to do a demographic and feasibility study. “They came to me and said, ‘Can you help out?’ I said, ‘I’d be honored to help out,’ ” said Thomas. “The District claimed that it had no substitute teachers because the substitutes were hired through an identified contractor.” —Pennsylvania Department of Open Records. On October 15, 2012 the Tribune Review appealed to the Pennsylvania Office of Open Records. After a full review of the appeal, North Allegheny was required to release the information it initially refused. Taxpayer dollars were spent fighting what the state determined was “a valid request for records.” The facts of the case are outlined in detail in the Final Determination document issued by the Pennsylvania Office of Open Records on December 3, 2012. The full text is available here. The administration’s actions in this case illustrate the same poor fiscal stewardship the district demonstrated in commissioning Jon Thomas, a consultant whose prior work on the district’s elementary schools resulted in a lawsuit that cost NA taxpayers half a million dollars, to give a “second opinion” on the matter of closing an elementary school. On August 22, 2012, Mr. Jon Thomas issued his Phase 2 Demographics and Feasibility Study. Estimated repairs at Bradford Woods were reduced from $14 million to $8 million. There were no estimated repairs listed for Peebles. Mr. Thomas recommended closing Peebles and concluded the population in McCandless would decline. Mr. Thomas and Mr. Briem were the only experts listed in the report. BWE Project Budget Summary. SaveNASchools believes that the district should NOT be relying on ANY advice from a consultant whose work caused the district legal issues in the past. Reliance on Mr. Thomas’s demographic information, enrollment projections, and other assumptions is NOT in the best interest of the district. 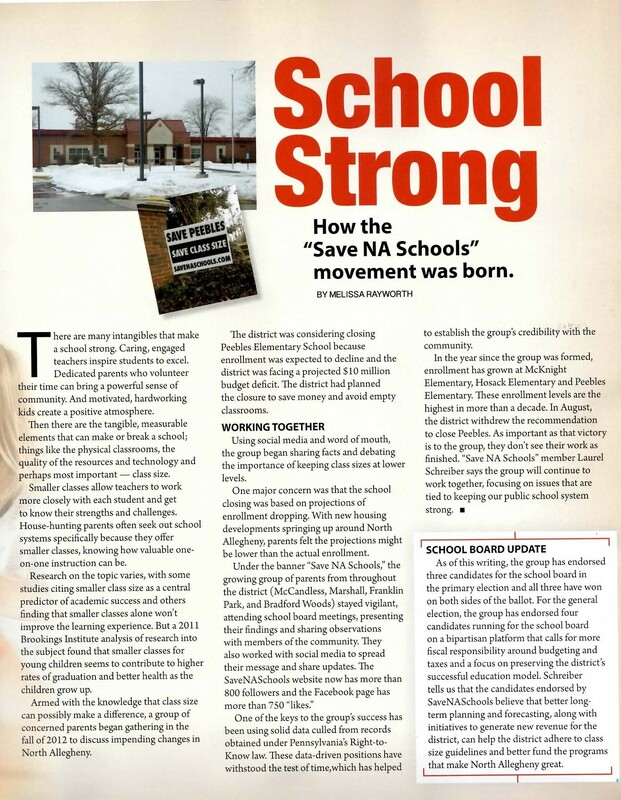 SaveNASchools believes that the district does NOT have the ability to close ANY elementary school without compromising its successful elementary education model. Our recent posts illustrate that the remaining buildings will see an increase in class size, an increase in sections, and the need to operate non-classrooms as classrooms (displacing programs integral to the elementary curriculum).